After her favorite aunt is found dead and an alarming box is mysteriously left on the doorstep of her aunt’s house now legally hers, Lavinia Esposito wants explanations. But, having cleared the package of explosives, the local cops are dumbounded by the precious stones which came without an explanation, just an address─her Aunt Livvy’s. Frustrated by the cops’ refusal to share their theories, criminal justice instructor Lavinia Esposito, a.k.a. Vinnie, takes investigation matters into her own hands. Vinnie is soon dragged into situations beyond her control, finding herself in hot water with the law, the crooks, and her Italian father. Willing to put her life at risk to find out what really happened to her beloved Aunt Livvy, and why jewels would be addressed to her aunt, Vinnie plunges ahead with her usual tenacity, bravery, and keen wits to solve and survive this mystery. FOR LOVE OF LIVVY HAS RECEIVED 4 AND 5 STAR REVIEWS! J. M. Griffin is a student of the human condition, wielding the written craft to stimulate the imagination much like she wields her paint brush. The pages are a blank canvas on which JM draws vivid characters. 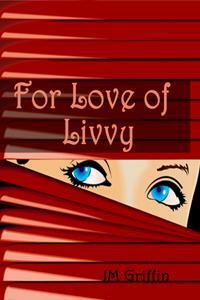 For Love of Livvy is the first in a series of novels featuring Lavinia Vinnie Esposito’s story. The series also includes “DEAD WRONG” and “DIRTY TROUBLE. She is currently working on her next release in this entertaining and sassy series – watch for it soon! JM lives in rural Rhode Island, a state she considers colorful and interesting.